I got to the hotel yesterday and ate a crepe with chocolate on it. 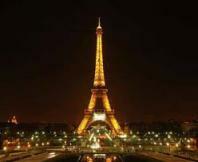 Then I went to go see the eifil tower when it was late so it was lit up and absolutley gorgeous. The time difference was only a couple of hours but, I was still tired so I went bacj to the hotela nd fell asleep.